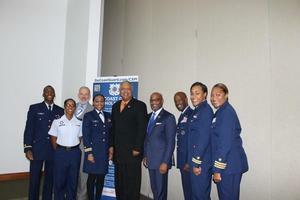 HAMPTON, Va. (November 28, 2018) – Norfolk State University hosted the HBCU Competitiveness: Aligning Institutional Missions with America’s Priorities Summit which included Hampton University, Virginia State University, Elizabeth City State University, and a host of Coast Guard members from Officer Trainees (OT) to a Vice Admiral. There were a total of five Admirals which included the Commander, U.S. Coast Guard Atlantic Area/Commander Defense Force East, the Superintendent Coast Guard Academy, Commander, Fifth District, Commander, Coast Guard Force Readiness Command, and Assistant Commandant for Human Resources. These heavy hitters were engaged by officials from each University. Hampton representatives included: Sr. Vice President Paul Harris, Dr. Jarris Taylor, Director of the Harvey Leadership Institute, Richard East University Police Department, and Lt. Claude Vann, III representing the Alumni. The keynote address was delivered by Dr. Arthur McMahan, Sr. Associate Director for the White House Initiative for Historically Black Colleges and Universities (HBCUs) at the Department of Education. Dr. McMahan is a retired Army Officer who previously served in Training and Doctrine Command, in addition to serving as an Assistant Professor of Military Science at Virginia State University. Highlights of his speech were: The White House Initiative for HBCUs is renewed by each President by Executive Order, the team is composed of five members, reporting to the Secretary of Education as well as the President. Dr. McMahan stated there are 100 HBCUs, with over 350,000 students attending. His team's goal is to strengthen HBCUs, along with the Universities’ ability to strengthen the community. The team wants to make HBCUs more competitive with the assistance of corporate partners that are assisting in Human Capital, Safety, Broad Band Internet, along with other crucial areas of concentration deemed necessary to strength the Universities. There was a briefing from Commandant for Human Resources where he talked about the commissioning sources for the Coast Guard, Scholarship Opportunities, Civilian employment opportunities and internships. He also discussed minority programs to address enlisted recruitment. A junior officer panel talked about what inspired them to join the Coast Guard, LTs Relf and McDonald served on the panel. This panel was very interesting because the audience learned patriotism is still alive, and Ensigns and Lieutenants want jobs that translate into civilian careers, they want to execute their mission daily.